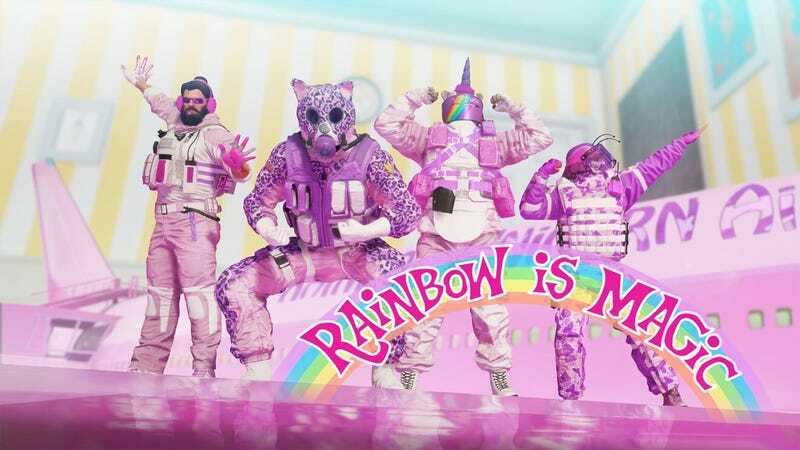 "Rainbow is Magic", a special event added to Rainbow Six Siege for April Fools Day and runs until April 8, brings over-top silliness , teddy bears, and lots and lots of pink for the tactical shooter. The capricious vibe of a children's animated show is not something you would expect to see in a game of Rainbow Six but it makes me want more. I'm totally into this for the bedazzled weapons and unicorns. I've seen some hilarious fun April Fools' day modes in my time, including the introduction of Prop Hunt in Call of Duty: Modern Warfare Remastered but Ubisoft really went completely out of this event. Rainbow Is Magic puts you on a colorful, toy size variant of the classic "Plane" card. The mission goal is to save or defend a teddy bear hostage, and this plays much like a standard game with Hostage mode with an added cartoon aesthetic. In fact, the redesign is so well thought out that I wish we could play this special event on more than one card. Ubisoft covered the toy version of aircraft with adorable wallpaper. Some of the aircraft's interiors are covered with unicorns or a collage of kittens, but some walls are jazzed up with neon lights in the form of hearts. I want someone at Ubisoft binge-watched My little pony: Friendship is Magic to get this kind of inspiration that is quite cool with me. Of course, you can't just roll on a toy plane in standard Siege gear, so Rainbow Is Magic puts every operator in a unique costume. Blackbeard would probably scare the teddy bear hostage, but to be fair, his candy-esque makeover also gives him an almost equally scary man's pile. My personal favorite is Tachanka, who cultivates a beautiful cute unicorn helmet. And since the operators are dressed up as crazy action figures with weapons, it further fits in on the theme that bullet holes animations appear as star art species that shoot confetti on feature. There is really so much attention to detail with Rainbow Is Magic. Siege 's regular mission tells has even been replaced by a lovely lady who sounds like she is the perfect candidate to read you a bedtime story. Almost every detail in the plane had a fun new look, which makes me think about what other cards would work for it whimsical theme. Perhaps the Kafe Dostoyevsky building can make an interesting transformation into a huge toy store. It could be three floors in the 1980s as toys come to life because the 80's had some beautiful wild things and toy stores were still relevant. "Theme Park" is a beautifully worn map, but it could be brought back to life with vibrant colors and perhaps some robots. Yes, an amusement park of murder robots. I have announced my love for Siege 's zombie-filled outbreak incident in the past, but Rainbow Is Magic gave me unexpected stupidity that I didn't do I don't know I wanted it. I take Siege more seriously than my other favorite shooters, but this event reminded me that it's okay to be ridiculous now and then, even in a very serious tactical setting. Rainbow Six Siege is over three years old and still ages nicely with a constant flow of new maps and operators, but I would like to see more frequent events like this to keep the game spicy. Give me more zombies or teddy bears. Give me the zombie teddy bear at the theme park. I'm not afraid.